It is dark in the part of the city where I am walking, as if there has been a blackout. I must go carefully, and be wary of shady characters in the streets. I arrive without incident at a gas station that is brightly illuminated. Families are gathered there with bicycles, as if about to depart on a group bike tour. Smiles and laughter, lots of happy energy. The scene feels familiar. Beyond the gas station, I must take care crossing busy roads with tram lines and converging lines of traffic. It is daylight when I come to a bridge. I must cross this bridge in order to get to an important meeting. I don't approach the bridge in an ordinary way, by walking a footpath or climbing up steps. I start scaling a rickety structure that seems to be part of the frame. As I climb higher, it becomes hard to find secure handholds or footholds. Metal struts are missing or hanging loose. I am now very high above a river valley, and I realize I am in real danger. But wait a minute. I remember that I have watched this scene on a cinema screen. I am in the middle of the action in a film in which the hero climbs a bridge in exactly this way. He gets to the top without falling. Since I am playing the hero's role, and the film is already "in the can", there is no problem. The moment I recognize this, I am across the bridge, on my way to my meeting. The meeting is in the offices of a film production company. The offices are rather shabby, and unfinished. In the bathroom, there is raw plaster on the walls and the sink has not yet been installed. The movie producer I am meeting seems rather coarse and vulgar, but I reflect that this is not unusual with certain types in the movie business. Others are there for the meeting, people who may be involved in a film we will make together. I am drawn to a handsome older woman in a blue dress. She was once a well-known singer who appeared in several films. Her glory days are over, but she is still attractive and I am intrigued by the idea that she may have a part in the film. She has a female companion, in a matching blue dress, rather plain, of the type that would be cast as a governess or housekeeper in a period English film. The singer opens her mouth. The jaws open wider than seems possible for a human, as wide as a big cat. Out comes an incredibly beautiful stream of sound. I am awed by this voice, and by the spectacle of the jaws opened tiger-wide. I am startled to notice that the song is not coming from the singer, but from her plain companion. There is a mystery here. I was excited and eager to know more when I rose from this dream during my Prague workshop. I discussed it with some of my dreamers, and received helpful feedback, but the big discoveries came in a workshop session, when we formed small groups for exercises in dream reentry and tracking. This is a core technique of Active Dreaming. We take turns to share dreams we would like to explore in depth by traveling back inside the dreams, with the help of shamanic drumming. While the dreamer reenters his dream, the others in the group travel with him, providing support and gathering information. I shared my dream of the long journey to the film company with three Czech women. I told them I would like more details on every stage of the itinerary. I was especially interested in the strange way my dream self approached the bridge, and the mystery of the singer whose voice seemed to be another person, and in what we were doing at the film company. I learned a lot from my own journey back through my dreamscape. It became clear to me that I was in Prague, from beginning to end, but also in an alternate reality of the kind it is very easy to access in that magical city. The gas station reminded me vividly of a period Esso gas station in a pivotal dream in my life that guided me in publishing Conscious Dreaming, my first book describing my synthesis of dreamwork and shamanism. As described in my later book Dreamgates, that dream led me to the publisher who sent me, a year later, on book tour, to a cinema in San Francisco where I found myself watching the re-release of "The Umbrellas of Cherbourg". When the male lead in the film achieves his life goal, of owning a 1950s-style Esso gas station, I recognized the key scene from my dream playing out in front of me, on the screen. So: the movie theme was clearly important. And just as important was the sense of abundant juice, and energy, available at the dream gas station. One of my Czech trackers picked up on the energy theme. "The gas station is a place where you re-charge and gather energy, among a community of people who believe in your work and can carry it in all directions, each traveling in their own way, on their own vehicles." In my reentry, the rickety structure I was trying to climb now looked to me like a set of scribbled notes and sketches for a work-in-progress. My power to teleport over the bridge came when I realized that, on a certain level, the work has already been completed. The most fascinating tracking was done by the Czech woman who located my dream, stage by stage, in the geography of Prague. She described a gas station within walking distance where families and friends gather to begin group bike tours. Next, a train bridge which it would be difficult or impossible for pedestrians to walk. Then, up the hill, the offices of a Czech film company that works with many foreign film producers. I became quite excited, since when I returned to the film company in my own reentry, it seemed that I was at a place where a movie was being developed from my work, centering on a location in the imaginal realm that I call the House of Time. I have described some of the group shamanic journeys I lead to this most interesting place in Dreamgates and in The Dreamer's Book of the Dead I report on conversations I have had there with "my" W.B.Yeats. If there is an ideal shooting location for the House of Time in ordinary reality, it may well be Prague, the city of magicians. A thoughtful man in my Prague workshop wanted to understand the illness of a family member. This was on his mind as he left our first evening session. I had suggested to everyone in our lively group that they should experiment with "putting a question to the world". This meant carrying a clearly stated theme on which they wanted guidance, and then being open to receiving the first unusual, unexpected thing that turned up in their field of perception tn the world around them as a possible response from the oracle of the world. Our dreamer walked down the snowy street and turned left into Old Town Hall Square. He saw an amazing scene unfolding in front of him. A headless bear was being pursued across the square by a pack of animals of various kind. The headless bear was a man in a bear outfit, missing the head. As he tried to grasp the nature of this astonishing theater, he saw a fox being chased by a second pack of animals. When he shared the episode with us in our morning session, we all felt that the world had staged a special production, a dream theater, just for him. There was a fine run of coincidence at work. On my first evening in Prague, I had taken a table at a restaurant in front of the astrological clock in the Old Town Hall, waiting for six o'clock to chime and the procession of sainted figures to emerge from behind their shutters. I heard these words in English wafting from a nearby table: "It was the time when the fox drank water with the bears." Though tempted to get up ad ask the speaker for the context, I was content to let the mystery words hover in the air. They had the quality of an enchanted children's story, full of wonder, and also gave me a sense of confirmation the animal powers would be very active with my workshop group in Prague, in harmonious ways, as indeed proved to be the case. Now I proceeded to discuss what the theater of the headless bear and the running fox would mean to me, if I were seeking guidance on someone's illness and the way to healing. I suggested that our dreamer might want to help his sick relative to find ways to connect with Bear and Fox, perhaps by growing a story for him that would carry the energy. We talked about the Bear as a great medicine animal, and about the cleverness of Fox, as an animal that must be able both to hunt and to hide and has been - for me - an impeccable guide to ancestral matters, which can carry the code for contemporary complaints, and also their cure. I have noticed that people who are attacking bears in their dreams, or running away from them, are often avoiding their personal medicine. That stood beside his bed. "Poor thing,' he said, "Poor silly thing! It's always time to feed the Bear (says the Bear). The Kafka Museum, on the bank of the Vltava river in Mala Strana, is an extraordinary and deeply disturbing experience, starting with the family photos under the shadow of the jackdaws. Soon you are in front of brilliantly doctored black and white film clips of the Old Town of Kafka's childhood, when he clung to the walls as the stern family cook escorted him from the family flat in the Minuta building (beside the Old Town Hall) to the German school in the Meat Market. The famously beautiful buildings sway and menace, as if about to fall or devour. Then the saints and angels of the Charles Bridge appear, shapeshifting into demons of wind and fire with streaming hair and snaking beards. You go down steep wooden stairs, lit by a hellish red light, where there is a sinister sound of gnawing. You are entering the first of a series of topographies of Kafka's imagination, created as installation art. This one is inspired by his story "The Burrow", the ultimate nightmare of any claustrophobic. You walk on, into an endless office, walled with dark metal file cabinets that fill corridor after corridor, evoking Kafka's loathing of the conditions of his Brotberuft ("bread-job") working in the "dens of bureaucracy" in the closing years of the Austro-Hungarian empire. You enter a passage in which strange scenes unfold on multiple screens around you. You step forward and there you are, projected into the mysterious drama as a figure in silhouette. The castle ahead of you is just a sketch that vanishes. Then it appears as the burred profile of the Prague castle. Then you come to barriers spiked with barbed wire. Then a darker, more solid castle rises above you, rearing dark towers and battlements. Will you be allowed in? If admitted, will you ever get out? Now you are in the fantastic world of Kafka's unfinished novel The Castle. There is no relief, no resolution here for any of the Angst and alienation we find in his works - rather, a sudden and jaw-dropping fall into his imaginal world and the elements of his life that fed his imagination and were ultimately devoured by it. You leave the world of The Castle and look at photos of the women in Kafka's life, none of whom he married. You wince at the model of the torture machine in his story "The Penal Colony", and squirm at the account of what happened when he read this gruesome piece to an audience in Munich in the only reading he ever gave outside his own country; three women fainted and the critics went for his blood. You feel how his nightmares of suffocation and of being throttled came home to roost in his body as he slowly starved to death, unable to eat, to drink or to speak after his tuberculosis swelled his larynx. They had not yet discovered how to keep patients alive on an IV feed. And you wonder about the extent to which Kafka may be a negative role model - and an important one - in understanding how the imagination rules the body. On the one hand, his fiction mirrored and anticipated his physical complaints, as well as the oppression he encountered within his family, his work and his society. On the other hand, by investing so much creative power in images of confinement, asphyxiation and impotence, he may, tragically, have brought his body into a corresponding pattern of behavior. He even wrote a story titled "The Hunger Artist", about a performer who deliberately starves himself until he is close to death. We need to be alert to how we use our imaginations, which can heal or destroy our bodies and take us to a place of freedom or suffocating confinement. I have put a recent biography of Kafka, and his collected stories on my bedside table, to pursue this thread, and others. Haunted by his life and his visions, I walked the night streets of the Old Town many hours after my visit to the museum and came to the extraordinary statue of Kafa that stands next to the Spanish Synagogue. Almost unpublished in his lifetime, little known in his native country until after the fall of communism, Kafka rides in posthumous fame on a remarkable mount. Is that a golem that is carrying him? [*] In Czech, the jackdaw is kavka. Like other Jewish families compelled to adopt Gentile names under the laws of the Austro-Hungarian empire, the Kafkas took the name of a bird or animal. Participants in the lively playshop I led in Utrecht last weekend had been invited to incubate dreams on our gathering before we met. I enjoyed hearing some of these as we came together in a pleasant space below street level, right on the bank of the Oudegracht. 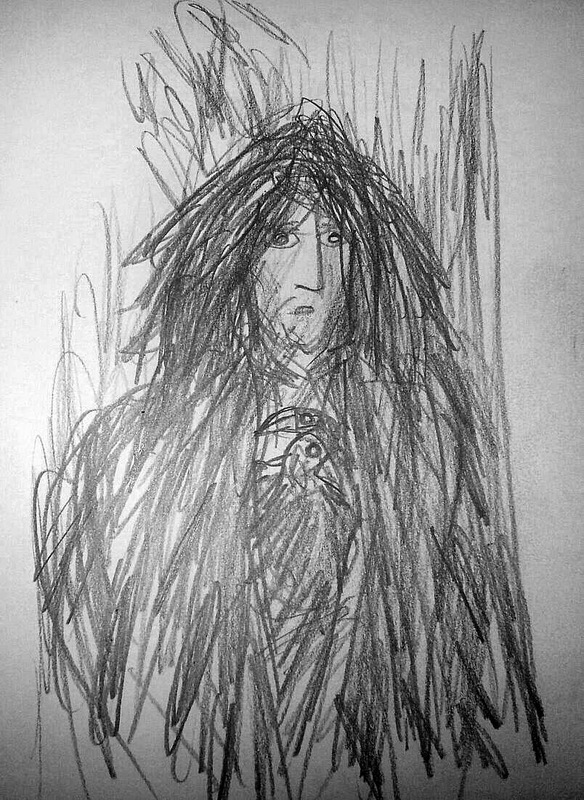 My favorite: a dream in which I appeared as a combination of Professor Dumbledore and Catweazle, a preposterous time-traveling 11th century wizard from an old British television series, who mistakes technology for magic. I was glad to be reassured that my dream self appeared better educated and more competent than Catweazle, and did not go about in the company of a toad! I was tickled by the reference to the headmaster of Hogwarts, especially after a personal experience in the last session of the day. I suggested to our dreamers that they could travel, with the aid of the drumming, to a Secret Library where they could gain information and inspiration on any subject that stirred their passion and curiosity, and meet a mentor in any field. I found myself drawn to a Map Room in my personal version of the Secret Library. The maps that compelled my attention this time looked like subway maps. Examined more closely, they proved to be maps of a deeper geography than the underground. The lines defined life trajectories in parallel realities, and they were never fixed. The map showed, with great clarity, what happens when a life path converges with, or veers away from, that of a parallel personality in another reality. Since I was in the Netherlands, I was not surprised to see that one of the moving maps showed convergence with the event track of a personality linked to me who was in Holland during World War II. Our proximity in space seemed to have mobilized a convergence of certain dramas, gifts and challenges between his time and mine. I remembered that Albus Dumbledore has a scar on his left knee that is described as a perfect map of the London Underground. When asked to explain this, his creator, J.K. Rowling, was taciturn. But I know what a certain kind of subway map means to me. Wonderful, questing spirits in our circle in Utrecht, with that earthy Dutch humor and instinct for survival. We moved effortlessly from sharing dreams to moving with their energy, using them as scripts for theatrical performance, and as doorways for shamanic journeys. I often reflected, during the active days and at our early, copious group dinner at La Connaisseur, on my sense of a very long connection with the Netherlands. This dates back to my childhood memories of the life of a Royal Air Force pilot who was shot down over Holland in World War II. It was requickened by a big dream, in mid-life, in which I found myself exploring the house of a magus, on a canal in a Dutch city. I roamed from room to room, fascinated by his magical equipment, his vast and eccentric library, and by a Persian carpet that lay, waiting for use, on his bed. When I reentered this dream, I found that the house was my own, that the magical machines still worked, and that the rug was most certainly on the flying kind. Then, too, the Netherlands has played a very important role in my work as a dream teacher. I first introduced the core techniques of my synthesis of shamanic journeying and dreamwork to a world audience at a conference of the Association for the Study of Dreams at the University of Leiden in 1994. And the first foreign edition of my first book on these matters, Conscious Dreaming, was published in Dutch, as Droom Bewust. During the night between our two days of group adventures in Utrecht, I felt blessed by a dream and a vision that deepened my sense of connection with the Dutch people and the spirits of land and sea in this part of the world. I dreamed of a tall, strong and beautiful young woman who had been used by men but retained an amazing quality of grace, innocence and majesty. In a waking vision, I saw her again as beyond age, accompanied by a dog. Her eyes were windows that opened into a sea crossing that I knew to be a portal to the Other Side. I felt I had been granted insight into the enduring strength of Dutch women, and that I was granted a glimpse of Nehelennia, the ancient Celtic-Germanic goddess of the North Sea, patron of travelers on both the ocean and the astral seas. I came to Barcelona in the company of Carlos Ruiz Zafón, one of its native sons. More precisely, my in-flight reading was La Sombra del Viento, which opens in the Cemetery of Forgotten Books, a nonlinear literary necropolis where books that no longer have readers are preserved against the day when someone will bring them back from the dead. I love the author's insistence that "every book has a soul. The soul of the person who wrote it and of those who read it and lived it and dreamed with it." I devoured this superior modern Gothic novel when I found the American edition (The Shadow of the Wind) in the Crow bookstore in Burlington, Vermont. I returned to it, in the original language, in hopes of bringing my Spanish up to speed for a ramble among Barcelona's haunted and haunting landscapes in between leading workshops in Frankfurt and Utrecht. Perhaps my literary selection helped to script my odd journey from the airport to the Eixample, the Gaudi-era district of Barcelona outside the Old City. My taxi driver was no novice. Elderly and formal, he carried himself stiffly, as if any slip from punctilio would scatter him to wind and shadows. He wore a triangular Velazquez beard, his speech was pure and courtly Castilian. I was not surprised when he denied all knowledge of my small hotel. I had printed out the details and read the address. My taxi driver declared that the street address I had printed from the hotel’s own website was a fiction. "There is no number 286 on the Carrer de Provença." He was not interested in the printout. He produced an ancient street guide, immensely fat and brightly colored, with loose pages that threatened to blow out the windows as we drove up the Rambla de Catalunya. "See," he pointed a pontifical finger. "There is no number 286 on that street." I thrust my printout of driving directions from the hotel website in front of him at a stop light. He glanced at it, then showed me, in cool triumph, that the directions led to number 249, not number 286. Odd, not even, and further down the street. I looked at the directions again. He was right. "Barcelona cannot be found on the internet," my driver declaimed. It took a mix of firmness and diplomacy to get him to make the necessary loop to come down Provença from the other side. Ah, there was Gaudi's Pedrera on the corner, an unplanned gift. Yes, there was a number 286. No external evidence that the grand bourgeois building housed a hotel, but a doorman hiding in a booth inside the entrance court allowed himself to be stirred from his esoteric studies to concede that there was, in fact, a hotel on the floor above. He escorted me up marble stairs to one of those cozy European elevators that give you the choice of sending your bags up alone or sacrificing your manhood. “Thank you for initiating me into the Barcelona of shadows and mysteries,” I greeted the charming girl at the hotel reception. “Yes, we did direct you to the wrong building,” she agreed when she looked at my printout. “I don’t know why that happened.” But I did. I could feel a story building. Entering neo-Gothic Barcelona in a style worthy of Shadow of the Wind, I was primed for adventures, though perhaps not for the battle that I was required to fight on my second night in Barcelona. This is the missing first page from my Barcelona journal, as posted on this blog. The way in is the way out. On Wednesday morning, after the Battle of the Barbican, I walked in the sun and took the metro to see Gaudi's unfinished cathedral, La Sagrada Familia. In the park opposite this amazing pile, I met a headless man, impeccably dressed. He came alive enough to whistle for a tip when I took his picture. Keeping one’s head can be quite a trick in Barcelona, but there are those who manage to get by without one. In the afternoon, I was buried alive. I have been buried alive. I agreed for this to be done as some kind of experiment that I myself may have initiated. I am lying now in a coffin-sized chamber of hardened earth. I tap on the roof above me when I decide I've been in here long enough. No one responds. Can they really not hear me? The earth above me is only a few inches thick. I am going to cry out, nervous now. Instead, I find a way to get myself out, maybe just by pushing really hard. I woke feeling cheerful, even triumphant, and greatly restored in my body. I smiled at the mirror function of the dream. I recognize that I have a tendency to get myself into some holes without checking how to get out! For most of the night that followed, in the default reality of my dreaming mind, I am writing while listening to an inner voice narrating the kind of book you can live inside. As the narrative goes on, and I continue to create in concert with my inner voice, a great city takes form all around me, its architecture stranger than Gaudi's. In this City of Life and Death, travelers step back and forth easily between different dimensions. There are doors through which veteran travelers can step back and forth between life and death, whenever they like. There are clothing stores with impossible price tags, or no prices at all, where those who make an arrangement with a private shopper can change into different bodies as easily as regular people change clothes.Like the living statues of Barcelona, they can shift without warning from suspended animation to elegant acrobatics. "Don't ask what you already know," was the counsel of a babalawo, a high divination priest of Ifa, the Yoruba oracle. I think he was correct. We annoy the spirits, and confuse our own ways, by constantly asking questions when the answers are already with us. I have many friends who start the day by putting questions to some personal system of divination, from Tarot to tea leaves. And many more who put a question to their dreams every night. I am in favor of seeking guidance from sources beyond the ordinary mind. But I have mixed feelings about asking all these questions, especially if the questions are on the same theme. There are questions that have to be lived, not merely answered. And it is often better to hear the questions the world is putting to us, rather than constantly putting our personal questions to the world. life will tell us what we need to know, if we are ready to hear. By attending to dreams, especially dreams we did not ask for and may or may not want, and to the voices of the Speaking Land (as Aborigines call it) we escape the trap of constantly moving among projections of our wishes and fears. Spontaneous night dreams and synchronicity speak with an objectivity the ordinary mind often lacks. 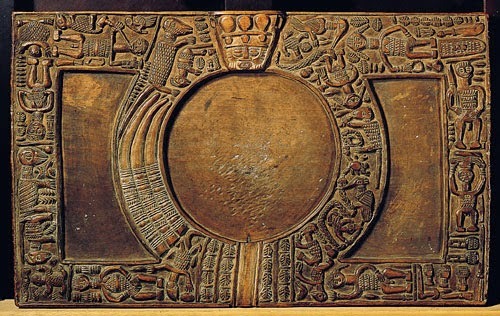 We can tap to awaken the spirits, as the reader of Ifa does with his divination tapper. But it is more interesting to let the universe and the spirits tap us. For some fun synchronicity games, including ways of allowing the universe to put its questions to you, please read The Three "Only" Things: Tapping the Power of Dreams, Coincidence and Imagination (New World Library). Oh, yes, I must add: the only teachers who interest me are ones who truly walk their talk. Thinking bull on the Rambla de Catalunya. Photo by R.M. They say you stole the sun. so the sun could shine brighter than before. because you are evil and unkind. at the price of wearing its colors. because you feed on death that feeds on men. You strip what rots from what remains. You give us the purity of the bones. and we are forced to improvise and transform. You won't let us swap our souls for a plan. in the darkest places, joking with Death. COMMENT: The kindness of ravens. Our collective noun for a group of crows is "murder". The word for a group of ravens is even crueler; those who know it speak of an "unkindness" of ravens. Yet I have found the raven to be an impeccable ally in seeing into dark places, and in training frequent flyers in the arts of the dream seer, I often call in the ravenous eye. Be it noted that in working with Raven this way, it is vastly desirable to call in a pair, as Odin knew when he sent off his twin ravens, Thought and Memory, to scout for him. I wrote this poem for Raven at the end of a marvelous adventure in group dreaming, when many of us were able to see true with the help of that raven eye. I am posting it today because of further excellent adventures in tracking with the help of the Two Ravens in my recent workshop in Frankfurt. 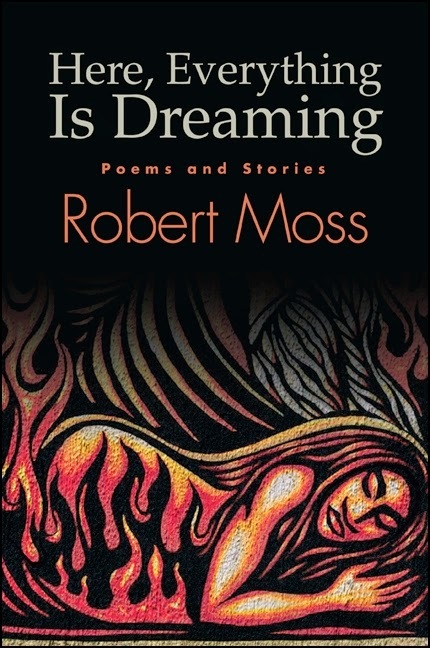 Everything Is Dreaming, published by Exclesior Editions, an imprint of State University of New York Press. I saw two members of my workshop group in the restaurant, already seated at a large window table, as I descended to the hotel restaurant to graze at the breakfast buffet. They smiled and waved to me to join them, but I had some coffee and a boiled egg at another table before I carried the rest of my breakfast over to theirs. "i wanted to give you some time to wake up before I put yu to work," I explained. "If you want me to sit with you, you'll have to pay the price. That means telling me a dream, or a fresh story. "I don't remember any dreams," the woman began to apologize. "You don't have to tell me a dream. You do need to tell me a story. Remember your assignment last night." As I often do, I had given members of my workshop a homeplay assignment: to bring a story or image that could provide the portal for a shamanic journey. "While you are thinking about it, " I went on, let me tell you a story about how stories are made. It involves the English writer Graham Greene, a consummate storyteller. His ability to write and entertain grew from a wound. When he was still in high school, he had a complete pyschological breakdown and his father - the principal of his expensive boarding school - rushed him to London to live with one of the first shrinks to practice there, back in 1920. Greene lived with this psychoanalyst for three months. He was given the assignment to bring a dream to the shrink every day in his office at eleven o'clock. Some days, Graham did not remember a dream. So he would make up a story in place of the forgotten dream. In this way, he got into the habit of creative invention. So, what is your story now?" I could see that all of this touched her where she lived. She had told us at the start of the workshop that she had a serious thyroid condition and had come in hopes of healing for that wound. She began to weave together things she had seen and experienced in our drumming journeys, and things that others had shared with the group, including my personal story of being received into the embrace of the Bear after finding the courage to brave up to a greater power. And of how, in my work with the Bear spirit, I have come to recognize that the primary form, for me, is that of Great Mother Bear. "Mother Bear has her paws on my throat," she started her tale. "I feel heat and pressure. It's painful, bit I know she is healing my thyroid. When she moved her paws away, she wants me to speak my truth and sing from my heart. I do this, speaking of my desire to lead a creative life. Then she wraps me in a huge embrace, and I know I have been healed." She quivered with excitement, and joy. "I have seen the Bear heal, exactly like this," I gave her immediate validation and confirmation. Sometimes Bear will open the wounded part. Always she will fold you in a great bear hug, in that healing embrace." She agreed to honor the Bear instantly by loading up another breakfast plate. And when we opened the workshop, and I asked our dreamers to draw a rapid-fire image from whatever was with them after the first short drumming session, I sketched a bear doctor healing the thyroid, while Great Mother Bear enfolded both doctor and patient in her vast and generous embrace. That evening, I went to Zum Bären, near the river in the Höchst district, to feed and honor my own Bear energies. Don't expect to count calories if you are dancing with the Bear! I am thinking about the story magic at the breakfast table. This is an example of the practice of imagination in everyday life. And a reminder that real shamans change the body and the world by telling better stories about them. You don't have a dream to share at the breakfast table? Then make up a story! You need healing? Then maybe you'll make up a story of the Medicine Bear. The Bear will come, if your story is good enough for your body to believe it. I guarantee it. I can't think of any financial district in the world that announces its dedication to money more flagrantly than in Frankfurt, where a huge neon Euro sign glows in front of the bank towers. One of the dreamers in my Frankfurt workshop shared a dream in which she watched from the roof of her seven-story apartment building, several kilometers a way, as the Deutsche Bank tower imploded and crumbled to dust, followed by all the high-rise towers of high finance around it. "I was safe and my building was untouched," she reported. "I felt my role was to be like a guardian angel and watch over people as they tried to cope with the collapse of their values and their normal structures." Speaking of those values, Frankfurt's downtown business district is cheek-to-cheek with its red light district. Maybe that's because they share the same moral codes. Side by side on huge plasma screens in the lobby of the hotel where I am leading my workshop (the hotel that promises "Starry Dreams Every Time"): amazing images of (1) a dramatization of an inspection of Adolf Hitler's brain and (2) a documentary about the possible migration of extra-terrestrial life forms on ancient asteroids. Whoa. A nonordinary multidimensional history tutorial, running during the break in our group shamanic adventures in the multiverse. No, that's not a smartphone. It's a shamanic headphone, one of the pair of ravens I helped members of my workshop for the Frankfurter Ring to invoke to help them track for each other, bringing back life guidance, glimpses of the future, and keys to healing. Odin, who was a shaman before he became a god, relied on a pair of ravens named Thought and Memory to bring him information, sending them out to travel wherever was required. Sometimes they flew so far that he became worried about their safe return. It is said that he was always more anxious to recover Memory than Thought. Another god who relied on ravens was Apollo; interesting that a god of light had black birds at home in dark places as his winged familiars. An ancient Hellenic shaman names Aristeas of Proconessus used to take flight from his mouth in the shape of a raven and was capable of showing up in two places, and two different times, in the same moment. I have dreamed of him too. Jeder Engel ist schrecklich. That's what I wrote on a card I contributed to our Coincidence Deck in the game we played in the closing session. It's from Rilke, and I translated this as "Every angel is terrifying." A more literal translation would be "terrible" in the sense in which C.S.Lewis wrote of Aslan: "he is terrible, but he is good". I took a little poetic license - and perhaps Rilke would approve - to make the point that on first contact non-Hallmark angels terrify, by driving us to wake up and step outside our comfort zone and the picket fences of daily ordinary mind. The workshop member who drew my message from Rilke was originally from Turkey. She found it highly relevant to her intention, which was to find joy in her work and her current life. The deeper powers that are hunting us, seeking to help us recognize and life our life calling, require us to brave up. You'll find the rules of my Coincidence Card Game, and other games for getting life guidance through synchronicity, in my book The Three "Only" Things, published in German as Fingerzeige des Schicksals. I took a German course as an undergraduate in order to read Rilke and Goethe in the original, but I was lazy about grammar, and regret that my spoken German is so limited. It may grow now that Active Dreaming is growing in Germany, and I have been invited back, and back. I did have the pleasure of learning how to offer my dreamer's wish in German, and of writing it on the flyleaf or title page of many copies of Traum-Heiler, the German edition of Dreaming the Soul Back Home. Mögen deine besten Träume Wirklichkeit werden! Add German to the list of languages in which my groups have now sung the Bear into the circle as healer and protector. My dream translator, Peggy Moeller, magicked up this version with all of 5 seconds notice, and the rhythms worked perfectly for the words I originally borrowed and translated from the Mohawk Indians. For the Mohawk, this song is both a lullaby used to comfort young children in the night, and a shaman song used to call Okwari, the Bear, as healer and protector. Singing for the Bear seemed like an act of reverence and restitution. But there was more. As we sang, and then as I drummed, I had a most powerful vision of Great Mother Bear, dancing with us, and dancing for Germany. She was seizing the dirty and bedraggled bearskins of male warriors and men of violence who had been possessed by the killing frenzy of the Bear, but not its power to heal and protect. I saw her cleansing the spirits of dead berserkers (literally "bear-shirts") and stripping away the hateful though-forms and energetic legacies of racism and hatred. And I felt how deeply this country is in need of shamanic tools for ancestral healing, and gratitude for the ability an outsider sometimes has to see the shape of such needs and to help bring through the healing, because he or she stands outside the historic tragedy and multi-generational guilt and angst of the people among whom he is traveling. How do you feed and honor the Bear? Well, food is always a good idea. After the first day of my workshop - where we went fast and deep while having loads of fun - I took a cable car downtown with native guides recruited that day for dinner at the wonderful non-touristy Klosterhof, a restaurant popular with locals. The establishment is dedicated to this version of the Benedictine message: "Ora et labora, said Benedict, pray and work. But who works hard should also eat and drink well and plentifully!" No table available, just seats at the bar, but when I suggested to Jenny, our charming server, that she could work magic, she agreed with enthusiasm. No sooner had I been given a tall glass of the house brew than she announced that she had the perfect table for us. I asked the table magician's advice on house specials, and she sang an aria of praise for a unique offering with a name designed to scare off all but the boldest of wordslingers: Schlägler Chorherrenschnitzel. A generous pork schnitzel, fried in butter, topped with bacon, slices of apples and mountain cranberries, melted cheese, and finally a fried egg. Really? I trembled a little at the prospect of a mountain of food with all these contrasting layers of flavor, but my inner Bear did not hesitate for a second. We'll have it. "Let me hear you say its name correctly," Jenny put me through a shamanic test. She was very kind to my atrocious accent. A mountainous plate duly arrived, and I found that, as promised, the many flavors and textures blended amazingly well. My inner Bear was fully prepared to clean the plate, but I told him that we would need to go hiking in the mountains to work off all this rich food if we did that, and he finally let me shove the plate away, uncleaned. A digestif? Of course. I chose the Klosterhofgold, a liqueur prepared with aromatic infusions of Angelica and Meisterwurz ( "Master Root"). This potion was invented by bibulous monks who insisted that it would blend the powers of heaven and earth in the body. It did wonders for the sniffles I had developed by sloshing around in wet snow after repeated redeye hopping between different time and temperature zones since I left Hawaii a week ago. The Bear in me was pleased, though he still wanted to finish everything on that plate. Top photo: With Peggy Moeller, my dream translator, at my Friday evening lecture for the Frankfurter Ring. My flight from Newark to Frankfurt was mostly empty, so I could stretch out, between chapters of the engrossing novel of interlocking lives across time, Cloud Atlas. This also meant I did not have a rowmate to contribute a fresh story. A lively flight attendant made up for this when I went to the galley to ask for fresh coffee. When she elicited what I do, she started telling me dreams from different phases of her life. At one point, she said, she dreamed over and over that she had gum stuck in her teeth that she couldn't get out. I remarked that if this were my recurring dream, it would lead me to think about what I needed to get out, how I needed to claim my voice, and where in life I was stuck. "Right on," she told me. "I was stuck in a bad marriage where I couldn't speak my truth. I got out of it after a dozen of those dreams." I was met at Frankfurt airport and escorted to my hotel by a man who had been hung on the cross and kissed by Leonard Bernstein. No kidding. A volunteer for my hosts, the Frankfurter Ring, and a world-class raconteur, he had been hung on the cross while playing Tristan onstage, and kissed by Bernstein when they shared their musical passions in the First class cabin of a Lufthansa flight. This seemed like an auspicious start to myadventure in teaching Active Dreaming in Germany, confirmed by the slogan on the wall above the reception desk of the Lindner Congress Hotel in the Höchst district: "Starry Dreams Any Time". After a little downtime, I walk the Bolongarostrasse under light snow and encounter a recurring theme in my everyday life. I am walking on a street I have never walked before, in an unfamiliar city, and a native comes up and asks me for directions in the local language. No, sorry, I could not direct the respectful German man to the post office and barely had enough German to make this plain. I glance across the street and see a fantastic sight: a huge metal hand, gripping a pen, projecting from a building. It feels like a personal message: Write on. It is in fact a celebrated sculpture by George K. Glaser called Die denkende Hand, "The Thinking Hand." It's 3:00 p.m. local time, and I am now thinking mostly about where to have lunch, and the relative merits of döner kebab and wurst with beer. I am in a section of the city that has become Little Turkey, Turkei-am-Main. I like Turkish food, but I would also like a beer, which I am not going to get in a hallal restaurant, so I turn left towards the river. I immediately come to the sign of two bears over the blue door of the Restaurant Zum Bären. Perfect. But - oh uh - the Bear restaurant doesn't open until 17:00, and the Bear inside me won't wait any longer to be fed. Back to one of the döner kebab places on the main drag, where I order in Turkish and end up by getting something a little different from what I thought I had asked for, slathered in more yogurt that I can normally be persuaded to eat. Not so bad. The lively young womenn at the next table are from Uganda and Japan but speak fluent Bulgarian to a staffer. Language is becoming quite a theme today. I strike up conversation but my enthusiasm falters when they reveal they are Jehovah's Witnesses and were in Bulgaria as missionaries. Oh, dear. I go back to my hotel for more quiet time before my evening lecture, and again notice that slogan "Starry Dreams Any Night." There is no German translation, which surprises me. I check some online dictionaries and come up with what might we a workable version, "Sternenklar Träume jeder Zeit", but I'm not confident. So I go back to the reception desk and ask the girls for the "official" translation. There isn't one. They're not sure how they would render the words in German. "There must be a way to say it in German," I observe. "It's such a lovely promise, and I am going to lead a dream workshop right here, at this hotel, over the weekend." Should they consult a manager, they wonder. I try my lumpy version. Sternenklar Träume jeder Zeit. They taste it and try it, correcting my pronunciation. "It's good," they pronounce, though I'm not sure the magic has survived the switch. I recount this incident at the start of my lecture to a full house in a beautiful octagonal room at the Saalbau Gutleit. I speculate that its meaning, in relation to my first teaching in Germany, could be that I am here to help translate ancient and essential ideas about dreaming into the contemporary German mindset. This draws vigorous sign of approval from many in the audience, as does my suggestion that the loss of connection with dreaming can indicate soul loss in an individual and cultural soul loss in a whole society. When I speak of ancestral healing and our need to connect with our animal spirits, I feel surges of approving power in my energy field. There are friendly spirits here who wish to support this work. When I tap the drum, inviting the people in the room to invite the right dreams and memories and fresh images to come and play with them, the Bear claims center stage in my own perception. I see Great Mother Bear, bring the Bear tribe together for healing, cooling the rage of the old battered warriors, licking and cleansing and healing old wounds. Once, under Charlemagne, a crusade was launched at the behest of the Church to kill all the bears, because the Church feared the ancient cult of the Bear spirit. In the killing frenzy of the berserkers ("bear-shirts") the Bear energy was distorted and called up for battle. Here and now, in Germany, I feel the Bear spirit is very much alive, and available for soul healing. My very creative hosts at the Frankfurter Ring organized a lucky draw for book prizes in the break during my lecture to a packed house tonight. When the lucky fellow who won a copy of Traum-Heiler (the German edition of Dreaming the Soul Back Home) announced that his name was Rainer, I disclosed that I took a German course as an undergrad because I wanted to read Rainer Maria Rilke in the original. "My parents named me for Rainer Maria Rilke!" he exclaimed, beaming. Life rhymes. And everyday life will speak to us in the manner of a dream if we will pay attention. Sharing dreams can be wonderful fun, giving juice for the day and putting a fizz of magic into the air. I found this again in conversation with the fabulous Kelly Sullivan Walden on my radio show. Kelly is one of those who helps bring the gift of dreams to people where they live, one of the dream ambassadors who are urgently needed in our society. As soon as we started sharing dreams on the air, sparking off each other, terrific energy was generated. And very soon we were producing confirmation of something Western psychologists still struggle to understand. Dreaming is not only individual, it is social. Dreaming, we get out of the body and the brain and travel around and visit each other. Kelly shared a dream that led me to believe that her dream self had visited my territory in the most literal sense. She dreamed she was with a man like Robert Langdon, the iconographer of The Da Vinci Code though she thought (in the dream) that this Robert might be Robert Moss. She was a little intimidated by his superior scholarship and knowledge of arcane things, and grateful that he was sharing one of his discoveries with her. The scene of their encounter was a cave. One part was filled with books, tribal artifacts and sacred art. The other part contained a wine cellar. There were many African sculptures and ritual objects. A great goddess figure rose from within this scene, and people started chanting syllables that sounded like “Amamama”. A crowd gathered to attack the goddess figure, but red flames leaped around her – part of her protection – and the chanting rose higher and higher. AMAMAMA. She seemed to be invincible. Kelly awakened excited and filled with awe, knowing that she wanted and needed to claim this goddess power. Now: I write and work in a Cave, my name for the basement apartment in my house. It is filled with books, tribal artifacts and sacred art, including a number of African sculptures and carvings that are prominently displayed, and many goddess images. In the room behind the one where I write, visible through the open door, is my wine cellar. Though I am not a fan of The Da Vinci Code I am very interested in tracking the evolution of sacred images, and live surrounded by many of these. Over the years, I have made many pictures of a great goddess figure who is a kind of Mother Africa, immense, sometimes seated in state in a market full of produce, under a great tree that is sometimes a baobab. In the praise name or chant Amamama, I observed on the air, I heard the words Alma Mama, Mother Soul, another of my names for this Ancient Mother. Kelly and I agreed that in her dream she might have slipped into my space and had an interview with me before our interview for my show. She talked about how, at the age of 6, she learned about how people can dream together when she shared dreams with her younger sister. Sometimes her sister would tell her what was going to happen in her dream before she finished telling it, because she had dreamed the same dream. I noted that many ancient and indigenous peoples talk about dreams as if they are entities or spirits that come and go in the night, with subtle bodies that can slip under the door or through a keyhole like a tiny gust of wind. In classical Greek, oneiros is not only a dream we may enter, but a dream figure that may enter our space. In ancient Mesopotamia, a word for “dream” also meant “zephyr”. I joked with Kelly that perhaps her dream self sometimes flies about as a zephyr, one of those little gusts of wind that can get through the tiniest crack. You can listen to my conversation with Kelly Sullivan Walden on my “Way of the Dreamer” radio show on Tuesday, February 12 from 9:00-10:00 a.m. Pacific, 12:00-1:00 p.m. Eastern, or download from the archive after the broadcast. You can find Kelly at her website. Her new book, It’s All in Your Dreams, will be published in May and I recommend it. The drawing is one of scores I have made of an African goddess over the years. Here she is the model for the Queen of Disks in my personal tarot deck. You don't see it at first, in the shop of glinting surfaces. You must go deeper into the store, among the mirrors and monstrances, under the riot of chandeliers, and even then you may miss it, distracted by multiplying reflections. Oh, there it is. It may even stop your breath. What is the monkey doing here? It now has your full attention. You remember the many times the appearance of a monkey has signaled: Watch out for monkey business. Of the time, in a fish restaurant on a lonely cove on the coast of Anatolia, you saw a monkey scampering across empty tables, and it heralded strange business indeed. You are thinking of monkey business now because of an eerie and exciting dream. You are going to an assignation in a hotel that looks like a ship, down by the South Street Seaport in New York. You enter this place by walking a gangplank. You are greeted by a strange young woman in semi-Goth attire, her eyes black-ringed with mascara, her eyelashes spiking. Her eyes aren't normal. They look like beads. To your right is a marmoset in livery, with similar makeup and beads for eyes. The girl tells you the dressy monkey has been "fluttered"; they wanted him that way. There is nothing ordinary about this hotel. A door from the lobby opens into an auto body shop. The door on the far side opens into a courtyard where a dozen women in long dark dresses and hats are working at old-fashioned sewing machines. Are they making clothes for a period ball, or a funeral? You decide you'll avoid the assignation someone arranged for you, in this House of the Fluttered Marmoset. You make your excuses and leave, and wake knowing you made the right decision when you recognized that monkey sign. I took the photos in a store in the Marché aux Puces St-Ouen de Clignancourt, the celebrated Paris Flea Market, in December. The dream was from last week, in Hawaii, and preceded some strange and shocking events.